The first CCAPS instrument was developed by Counseling & Psychological Services at the University of Michigan in 2001 for the purpose of creating a high-quality, multi-dimensional assessment instrument that was affordable and clinically useful for college counseling centers. Based on this foundation, the current family of CCAPS instruments, clinical/administrative reports, and related research are managed by CCMH as a service to university and college counseling centers. The CCAPS instruments are intended to meet the clinical, research, and administrative needs of counseling centers while also contributing valuable information to the science of mental health in college students. In addition to very strong psychometric properties and a balanced rational/empirical design that is highly relevant to clinical work in counseling centers, the CCAPS instruments provide regularly updated peer-based norms drawn from very large samples. The CCAPS 2015 norms are based on more than 230,000 clients. The current CCAPS norms (2018) are based on more than 388,000 students seeking counseling services at institutions across the US. 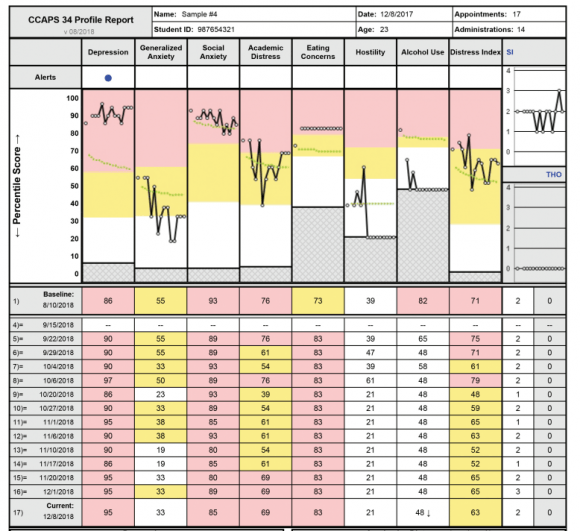 Because of the size and diversity of the norming group, clinicians can feel very confident that a scored CCAPS profile provides an up-to-date, relevant, and accurate evaluation. 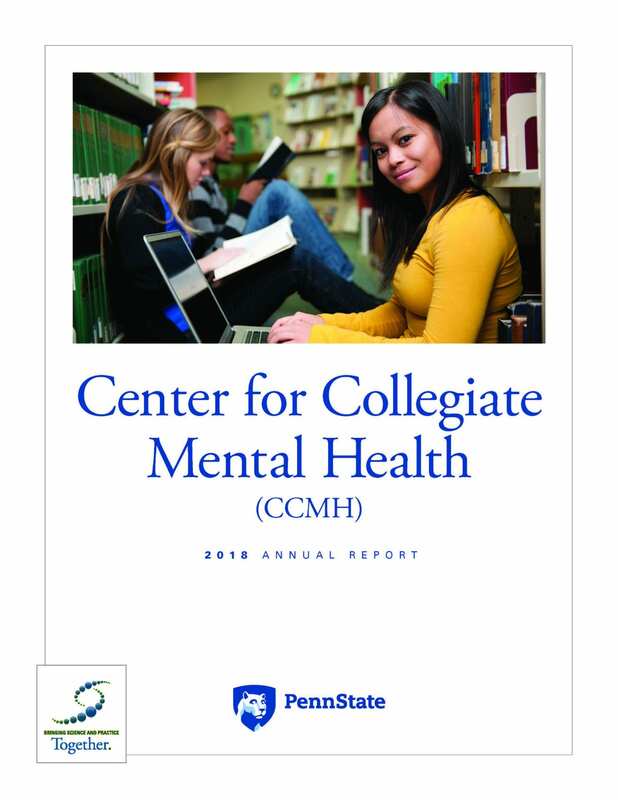 The CCAPS 2018 Manual and CCAPS 2018 Profile Reports were released to CCMH Members in August 2018. The CCAPS norms will be continually updated and improved as data becomes available. Updated norms based on more than 388,000 clients. The CCAPS-62 was first released in June, 2009 and was updated in 2012. It is a 62-item instrument with eight distinct subscales related to psychological symptoms and distress in college students, and incorporates a general Distress Index. Details about the development of the CCAPS-62 can be found here: Locke, B.D., Soet Buzolitz, J., Lei P.-W., Boswell, J.F., McAleavey, A.A., Sevig, T.D., Dowis, J.D., & Hayes, J.A. (2011). Development of the Counseling Center Assessment of Psychological Symptoms-62 (CCAPS-62). Journal of Counseling Psychology, 58, 97-109. The CCAPS-62 takes approximately 7-10 minutes to complete. Due to its more comprehensive nature, sensitivity to low-range distress, and the inclusion of family-related questions, the CCAPS-62 is best suited for initial and post-treatment assessments though it can also be used to monitor ongoing treatment. Clinicians find the range of items under each subscale clinically useful during initial assessment and at termination as a useful check on treatment effects. The CCAPS-34 was released in September, 2009 and updated in 2012. It is a 34-item instrument with seven distinct subscales that are related to psychological symptoms and distress in college students, and incorporates the Distress Index. All items of the CCAPS-34 are present in CCAPS-62 under the same subscales. The CCAPS-34 does not have a Family Distress subscale and the Substance Use subscale of the CCAPS-62 is renamed Alcohol Use in the CCAPS-34 because all subscale items refer to alcohol. The CCAPS-34 takes approximately 2-3 minutes to complete, can be used as a brief assessment instrument at any point in treatment and, due to its brevity can be used for repeated measurements of clients at every session, a specific interval, or on a calendar basis. 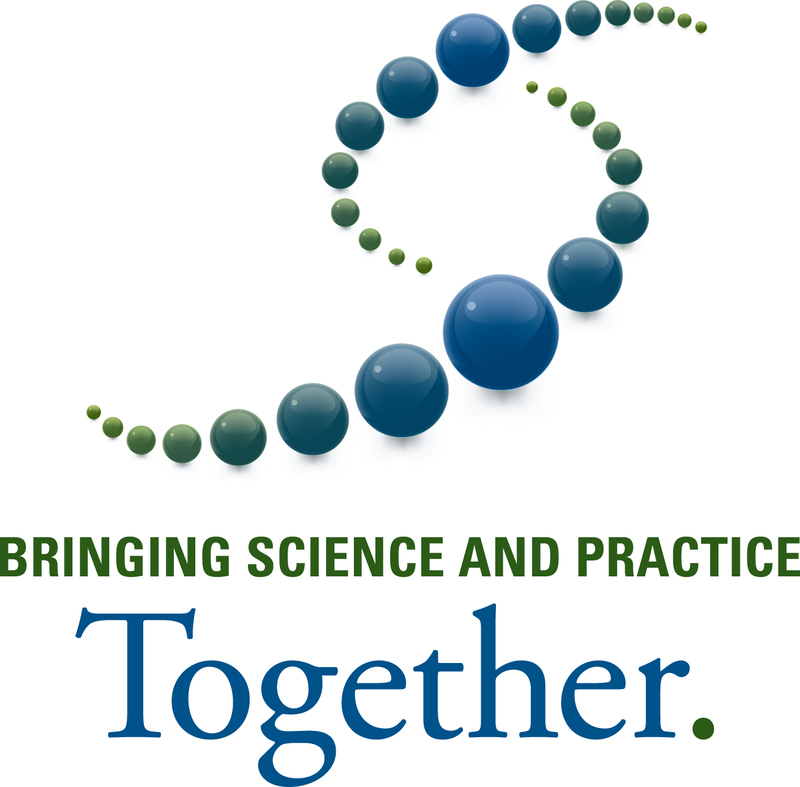 The CCAPS is available to CCMH counseling centers and to researchers. Non-counseling center entities are required to contact CCMH to learn about additional distribution policies. To request a copy of the CCAPS 2018 User Manual please contact us. CCAPS-Web – A dedicated website for users without an EMR or who use an incompatible EMR. The CCAPS has been translated in five languages: Simplified Chinese, Traditional Chinese, Japanese, Thai, and Spanish. Currently, German and Turkish are being translated. These translations may be requested for research purposes. Translated CCAPS are not permitted to be used clinically. If you would like to learn more about our Translation Policy, please email ccmh@psu.edu.